BJP's Mukul Roy today moved the Delhi High Court against the Centre and the West Bengal government over his phone allegedly being tapped. 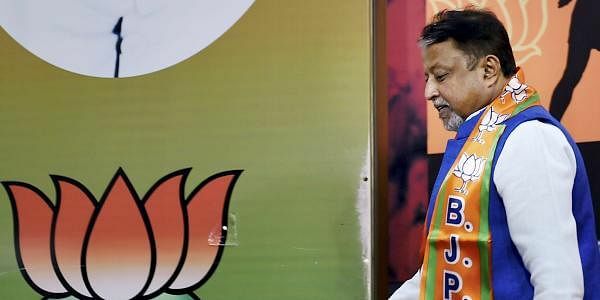 NEW DELHI: BJP's Mukul Roy today moved the Delhi High Court against the Centre and the West Bengal government over his phone allegedly being tapped. The former Trinamool Congress MP, who left his old party to join the BJP earlier this month, alleged that his movements were constantly tracked during his stay in Kolkata and Delhi in the last few months. The plea was listed before Justice Vibhu Bakhru, who posted the matter for hearing on November 20. The plea sought directions to MTNL and Vodafone, Roy's telecom service providers, to produce before the court directions, if any, issued by the Centre or the state government to intercept telegraphic messages originating from or received by the leader or any of his relatives. Advocate Kumar Dushyant Singh filed the petition on behalf of Roy. He claimed in his plea that similar apprehensions were put on record by several other persons not belonging to the ruling party in West Bengal. "Recently Babul Supriyo, minister of state for Heavy Industries and Public Enterprises, also alleged that mobile phones of selected individuals were being tapped in the state of West Bengal," the plea said.